there’s a phone app for everything and now there’s one for my friends! in my little quest to meet every facebook friend i have, i sometimes come across friends who share my secret: agoraphobia. fear of the marketplace is the translation from Greek, but really, it’s fear of everything. 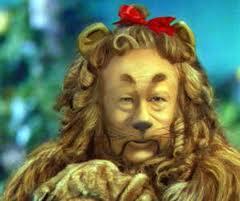 in the 1939 movie the wizard of oz, bert lahr played the cowardly lion, afraid of everything! sometimes i feel like the lion! one of the things i will be doing in los angeles is meeting with my facebook friend brandon spellman day. he is a video game slash computer slash programming genius and he has experienced his own moments of being a cowardly lion. he is over that period in his life and he wants to help others who are in the thick of that fear. he is creating a phone app that will allow agoraphobics to chart, monitor and encourage themselves to shove past boundaries. brandon is kind enough to have me help him with it and the los angeles trip is an opportunity for us to complete that project! yesterday i had lunch with facebook friends bonnie, tony and charles. charles is presently struggling with agoraphobia. and he’s promised to test drive the phone app. what about you? would you find an app like this helpful? i look forward to meeting my facebook friend brandon! This entry was posted on Wednesday, July 11th, 2012 at 8:16 pm	and tagged with cowardly lion, facebook, fear, friends, friendship, los angeles, phone apps for agoraphobia and posted in Uncategorized. You can follow any responses to this entry through the RSS 2.0 feed. Interesting! at one time in my life I suffered with this malady. thankfully, that is in the past and I’ve moved forward. would like to know more about the phone app once it’s perfected and launched.